Finan Home Service is London’s knob and tube wiring specialist. Knob and tube wiring is single conductor wire that was used in the late 1800s up until roughly the end of the Second World War. The only real solution to knob and tube wiring in your home is to rewire the remaining knob and tube wiring and bring the home up to today’s codes and standards. This involves a major construction project that can take up to three weeks to complete. Our electricians are Wiring Wizards and are the absolute pros in working in London’s older homes. We receive a lot of requests to rewire London’s finest homes, when the utmost care and sensitivity to the heritage of the home are required. A typical home rewire will range in cost from between $9,000 and $15,000, depending on the size and extent of rewiring that’s already been performed. Unlike everyone else in the city, we are prepared to spend hours with you, at no charge, to evaluate the knob and tube wiring in your home and provide recommendations on repair and replacement. If you’d like to learn more about your electrical system and investigate the possibility of rewiring your knob and tube, contact us for a free, no-obligation home consultation. It is ungrounded, which creates a greater chance for electrocution or shock to you or your appliances. It is very old wiring that has, in many cases, very deteriorated insulation that can lead to a fire. The original receptacles and switches are not CSA approved and, in many cases, the contacts are very loose leading to poor connections and potential fire hazard. Unfortunately, because over 90% of the wiring in a home is concealed behind the walls how could anyone really know if the old knob and tube is safe? We found this knob and tube wiring deteriorating behind the plaster of a customer’s wall – a fire waiting to happen. We consider knob and tube wiring like any other aspect of home maintenance – like your roof, your furnace, the plumbing, etc. There comes a time when old, outdated equipment needs to be replaced. We prefer preventative maintenance and repair of your electrical system, as opposed to responding to emergency calls when disaster strikes. Can we get insurance if our home has knob & tube wiring? Most insurance companies will not insure people with knob and tube wiring. Simply cleaning up the wiring in the basement does not adequately update the wiring to make it safer for your family. As a result, many people have found that although they’ve spent some money to “correct” their knob and tube woes their solution does not satisfy their insurance company’s requirements. Can we sell our home with knob & tube wiring? In today’s real estate market finding a buyer who’ll purchase your home “as-is” can be a daunting task. Buyers are expecting more for their money, and given that many people have spent time, money and energy upgrading their homes, there are typically better purchase options and value for their money on the market than a house that still needs the knob and tube wiring replaced. Is knob & tube wiring a do-it-yourself fix? Quite often, someone, somewhere at some time has made some changes to the old knob and tube wiring. When knob and tube is manipulated, modified, or spliced into with new wire the homeowner is just asking for trouble. Most two-story houses take approximately one week to rewire – don’t take a one-week project and turn it into months of agony. When the wiring is exposed to the elements, it has a tendency to dry-out and become very brittle. This causes two problems. First, the insulation can crack, exposing the copper wire beneath. Second, the connections can become very loose. Another very serious fire hazard that causes the deterioration of knob and tube wiring and unfortunately occurs quite commonly is the dreaded shared neutral. In this situation, one neutral wire becomes overloaded when the hot wire from another circuit gets tied into it. 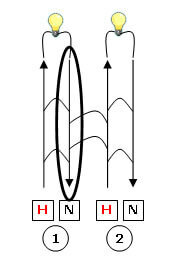 As you can see, circuit #1 now has two “Hot” lines (indicated by the red “H”) connected into it. This creates increased resistance in that neutral wire as it is “shared” by those two hot wires. Increased resistance leads to heat build-up. This heat build-up commonly causes those neutral wires to become very dry and brittle. In more drastic circumstances, resistance at connection points, as in old switches and two-prong receptacles, can cause these devices to char, melt and potentially catch fire. Is there an affordable band aid fix for knob & tube wiring? 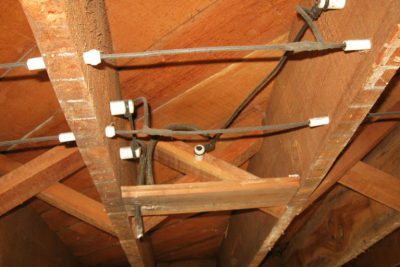 Clearly there are some reasons why knob and tube wiring should be replaced, but not everyone has the time, inclination or budget to rewire their house. A knob and tube clean up is where the basement and attic wiring are cleaned-up and GFCI receptacles are used to provide some degree of protection to the circuit. The thinking here is that by cleaning up the basement wiring, you’re likely to correct many handyman modifications and areas where the wiring has been broken as a result of manipulation. Unfortunately, as we saw in the above picture, we commonly find real safety problems concealed behind the walls and not located in the basement or attic. As well, GFCI receptacles will not work in situations with shared neutrals. As a result, homeowner’s can spend upwards of $2500 performing these band-aid fixes, only to find that they’ve wasted their money! There’s another important reason why we have chosen not to perform this repair. Simply put, it is seen as devious in many situations, as the knob and tube effectively becomes “hidden” in the sense that all one sees in the basement is new wiring. Without sufficient background and knowledge we have found new homeowners shocked that the house they thought was completely rewired was, in fact, not. We have seen far too many lawsuits over this issue in the past few years and as a result, have chosen to take the high road by only offering a solution that suits everyone’s best, long-term interests. Book a free in-home knob & tube wiring consultation. Knob & Tube Rewire – Holes! Holes! Holes!